As of late, M and I have been under deadline for a few items. I love working for myself but often it means juggling five different projects that occasionally all have the same Friday deadline. It keeps me busy but I’m not always the best about eating. For dinner the other night I had goat cheese smeared on bread with grapes and honey. Not a bad meal, but that’s been the norm- quick/simple. (But don’t be fooled, pizza totally happened at least twice in the past week). Eventually after the random eating spree, I need a big salad. Preheat oven to 375˚. In a roasting pan, toss beets with olive oil and sea salt. Cover the pan with foil and place in the oven. Roast for around one hour- until beets are tender. Remove from the oven and let cool enough to handle beets. Peel the beets and cut into wedges. While beets are roasting, place the pine nuts in a pie plate and bake for 6-7 minutes, until toasted. Remove and let cool. To make the dressing, peel the lemon with a sharp knife, making sure to remove the pith. Cut the lemon into small pieces. In a bowl, whisk together remaining 1/4 cup olive oil with lemon zest, lemon juice, salt, and pepper. Add chopped lemons. Toss together the avocado pieces and arugula with half the dressing and transfer to the serving dish. Add beets and remaining to the bowl, toss, and add beets to the top of the salad. Top with toasted pine nuts and shaved cheese. I love the simplicity to this! I actually make a salad very similar to this, but minus avocado…that needs to change! Looks beautiful and refreshing. 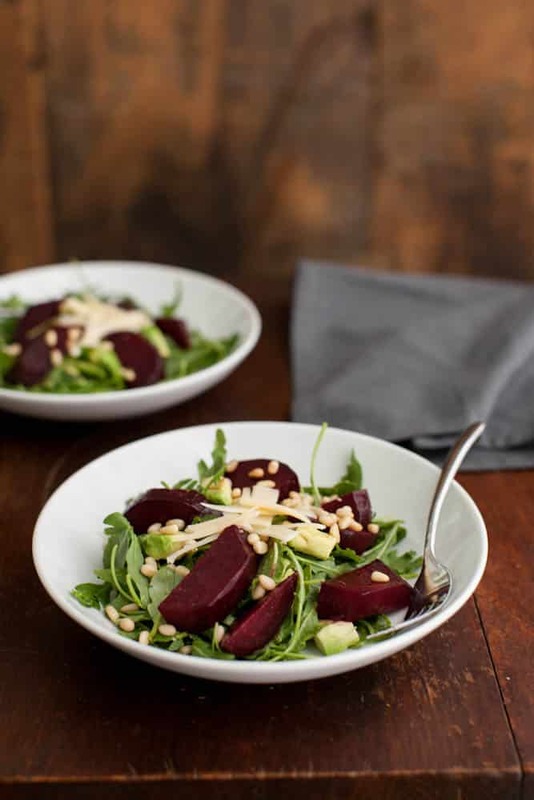 I’ve never paired beets and avocados before,I’ll be giving this a try! This looks amazing. 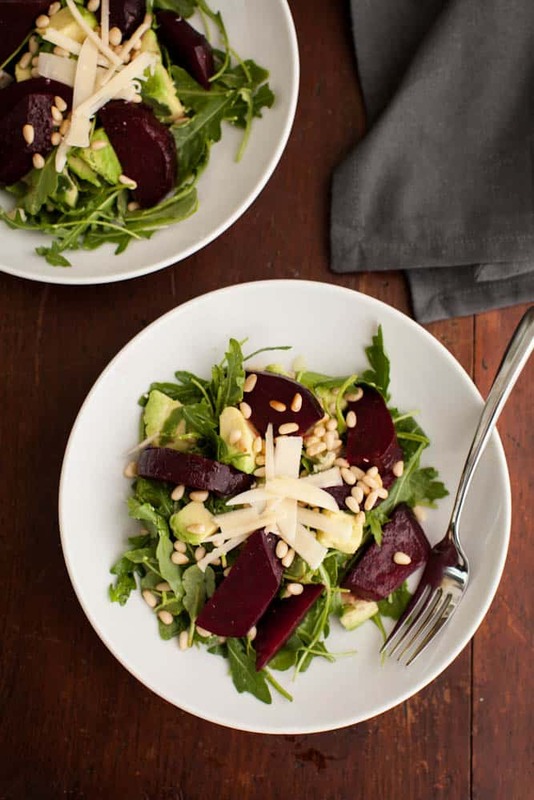 I am falling in love with Beets in my salads. Congratulations on the post and your cookbook! 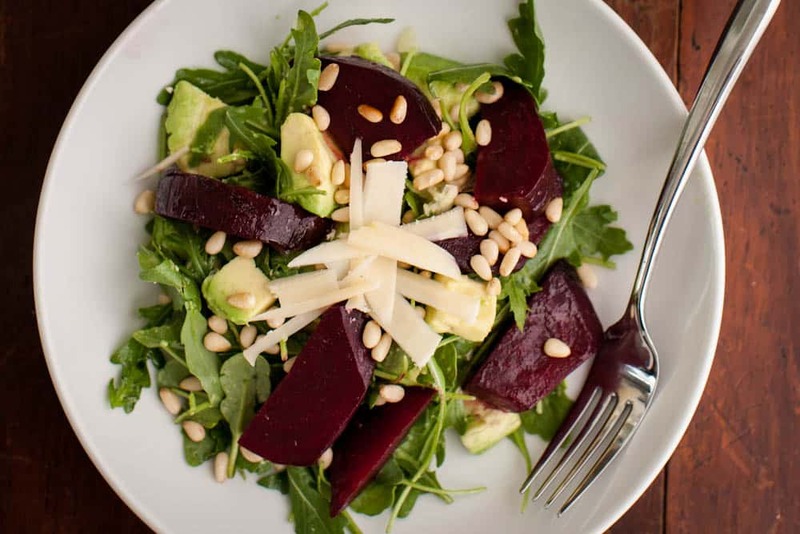 Beets, avocados and cashews are full of Omega 3, good for memory! So excited to see your salad recipe. 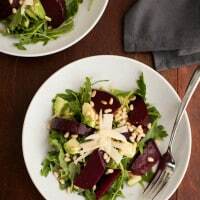 Beets-Arugula-Avacado-Pine Nuts: all a favorite of mine and never combined together before. Beautiful picture. Can’t wait to give a try.